You’ve seen the signs- walls of red tinsel lining Target, wrapping paper advertisers going door to door, and of course, red cups at Starbucks. That can only mean that the holiday season is right around the corner! Looking for the WOW factor this year? Check out a couple roundups for the best smartphones that came out of 2014. (1) Business Insider started off their top-10 list with the best selling iPhone to date: Apple’s new iPhone 6. Lower on the list was Amazon’s first ever smartphone- the Fire Phone. And Samsung’s flagship dirt-proof, water-proof smartphone Galaxy S5 was not far behind. (2) ZDNet listed the ever-popular Apple iPhone 6 Plus as their #1 smartphone this year. Runner-ups included the HTC One (M8) and the just-announced Samsung Galaxy Note 4. Not surprisingly, we’re seeing a lot of phablets top these lists. (3) From here on our, we see similar names top the lists of Laptop Mag’s favorite phones of 2014. (4) CNET even lets you search best phones by different features, brands, and even ratings on their cameras. Of course, your loved one will need military-grade protection for everyday bumps and drops. 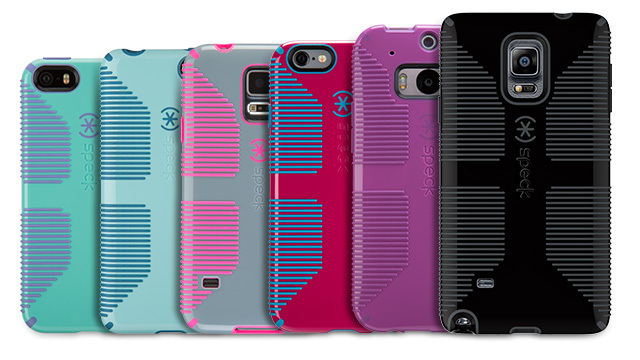 Shop Speck for ultra protection in super slim designs– perfect for stocking stuffers that everyone in your family will love.